The LEDs of the footpods are a nice feature for running at night, to increase your visibility and stay safe. Furthermore they function as status indicators so you know what your ARION is doing. Plus, we think they just look cool. Fire up the app and go to Menu > Settings > LED color. 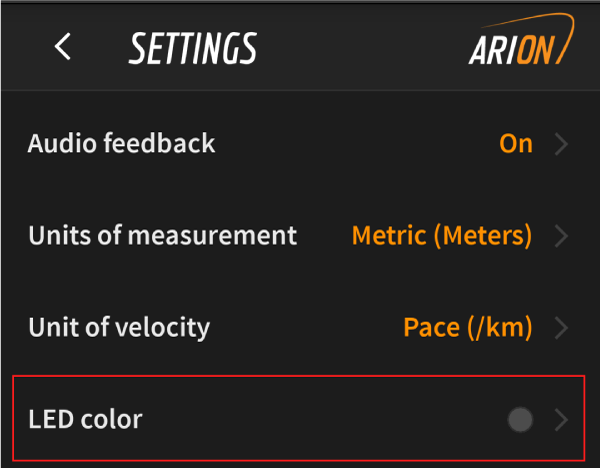 To see the custom LED colors in action you need to connect the ARION footpods to the insoles. Firstly, in the settings, don´t forget to actually flip on the ´Use custom LED color´ switch in order to make your changes take effect. You can flip this switch back of at any time to return to the default colors. Use the color wheel to select the color you want. When your footpods are connected to the insoles you can see the changes live on your own footpod. 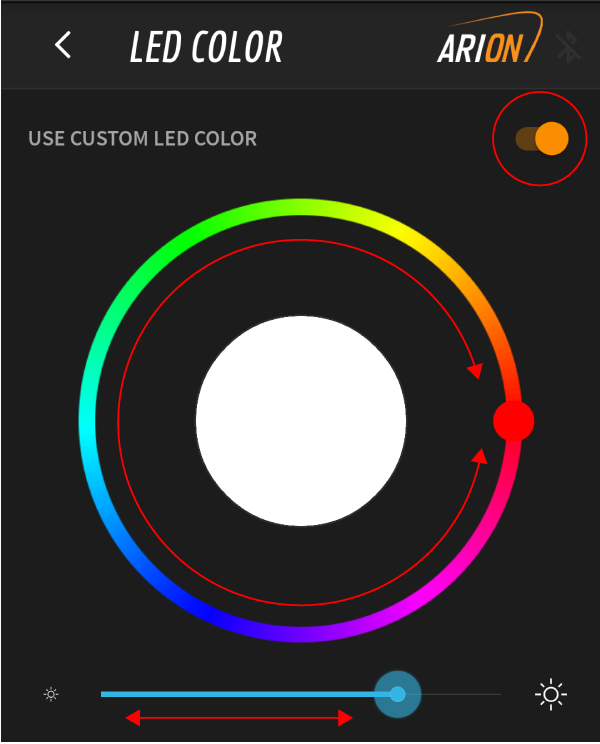 Use the intensity slider underneath to adjust the brightness of the LEDs. The more you move this slider to the left (lowering the brightness) the more battery you will save, allowing you to go running for much longer without the battery getting depleted. Moving the intensity slider all the way to the left will turn off the LEDs completely. Note: When you exit this screen, the LEDs will return to their standard blue state. Don't worry, this is meant to happen. As soon as you start a run (any run) the LED colors will change back to the color you have set in the LED color settings.